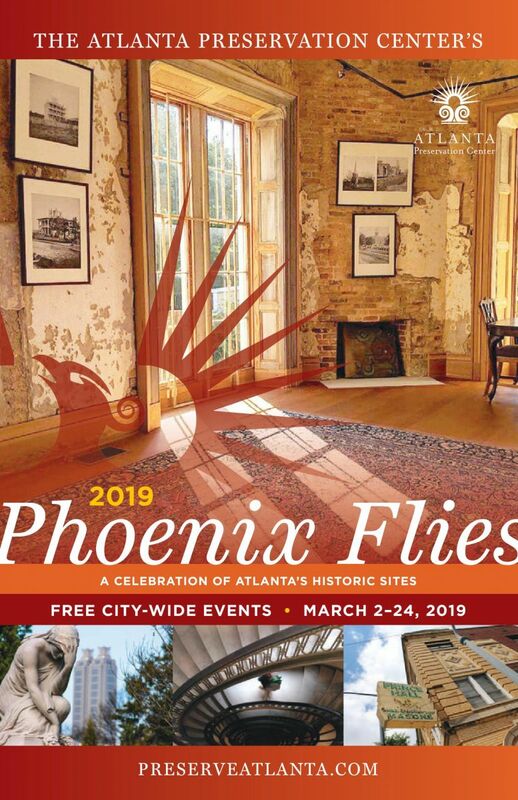 Atlanta Preservation Center :: The 2019 Phoenix Flies: A Celebration of Atlanta’s Historic Sites is returning for a 16th year! The 2019 Phoenix Flies: A Celebration of Atlanta’s Historic Sites is returning for a 16th year! Atlanta’s historic built environment of buildings, landscapes, and neighborhoods is an integral part of the City’s culture and economy. The Phoenix Flies Celebration provides an opportunity to learn about, celebrate, and strengthen these assets to the benefit of all. The Phoenix Flies is here! We have been hard at work putting together the events for the 2019 Phoenix Flies Celebration. For this year's Celebration, we have brought together 104 Preservation Partners from across the city. Over a dozen new partners have joined the celebration this year, including Atlanta Legal Aid, located in the old Elks Club building downtown, The Atlanta Opera, Atomic Films/Pratt-Pullman Yards, the DeKalb History Center, the Freedom Park Conservancy, Hotel Cermont, UGA's Hargrett Rare Book & Manuscript Library, the Imperial OPA Circus, the Kronberg Wall, the Met/Candler Warehouses, Newport US/RE, Park Pride, the Patchwork Art & History Center, and the Plaza Theatre. The Ponce Condominium, Oglethorpe University, and the Whittier Mill Village are among the returning partners from past Phoenix Flies. All events are subject to change or cancellation without notice. All events are attended at the risk of the attendee. Some events require reservations. Please see the program for additional event information and check back for updates. Questions? Remember to review the reservation information and the FAQs section of our website. As with all great undertakings the Phoenix Flies Celebration cannot be accomplished alone. The Atlanta Preservation Center relies on our Preservation Partners, sponsors and the general public to make the program a success year after year.